We perhaps can say that the Squadron really lived up to its motto in the last phase of the Burma Campaign when it played a vital role in chasing the Japanese out of Burma in just seven months, starting from YAZAGYO in mid-January 1945 to MEIKTILA in Mid-August 1945 when the Japanese surrendered. Swift, indeed, and avenging the retreat of 1942 when the Japanese occupied Burma. 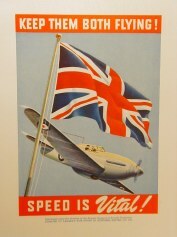 This site is Dedicated to the men and women who served with the RAF 113 Squadron during the first and second world wars. We and every future generation will be forever indebted. If your looking for information on the RAF 113 Squadron or general information on the RAF involvement in the Middle and Far East theaters, then you have found your way to the right place and needn't look any further. Pour yourself a coffee / tea or scotch and put your feet up! we hope you enjoy your visit and find the site both entertaining and informative. Most of the stories and photographs on the site are new and have "never before been seen by the public". Of special interest in the HISTORY ROOM is the "Story Of The 113 Squadron" which is quite unique in that it is a story in progress. Each veteran, friend or family member is encouraged to pick an appropriate spot in the story and add a paragraph or page of their own. The end goal being a complete personalized history of the Squadron written in the veterans or their families own words. Already well underway, it is sure to produce a delightfull and interesting evolving story. If your looking for a family member your first stop is the SQUADRON PERSONNEL room and perhaps the AIRCREWS and LOSSES section. Also check out the bulletin board as there could be someone looking "for you" or your family. If you are doing research on a particular area or topic, be sure to visit the RESEARCH ROOM. Here you will find a growing library of actual documents along with references to books and other materials for further research. INSTRUCTIONS: To find your way around the site, note that you have scroll bars on either side of most pages as you see on this one, use these to scroll the pages up and down. On some pages you will also note that there is a scroll bar along the bottom as well, use this scroll bar to move the page from side to side. The links in the left hand frame are like chapters in a book, clicking on any one of these will take you to the start of that chapter. Along the top of the starting page for each chapter (except this one) are links to the "individual pages" within that chapter. By Clicking on these you can move through each page in order or jump back and forth between pages. At the bottom of every page is a picture of a "hand pointing up", clicking on this will take you to the top of each page. If you get lost, clicking on the "HOME" button on any page will bring you back to this opening page for the site. Links are in this COLOUR, once you have visited the page the link changes to this COLOUR. Within a chapter, the page you are on will be indicated by this COLOUR . Note also the page you are on will be bolded without an underline like the link WELCOME on your left. Note: To do a search on any page in the site, press your control key and while holding it down press your letter F key. A box will pop up giving you a list of search options. NOTE: This only searches the page you are looking at, not the whole site. To search by date use the format DD/MM/YYYY, example 30/01/1942. Note that not all dates have been standardized in this format yet. Also try searching on both the day before, and the day after, the event you are seeking, aside from errors in recording dates, the reason is that a flight could have left base prior to midnight but crashed in the early morning hours of the following day. When searching on a place name, keep in mind it can be spelled many ways and to confuse matters worse, every veteran spelled them differently and had nicknames for many places. Try various spellings when searching. Example: Gerabub - Giarabub - Jaghabub. Another example: Ma'aten Bagush - Maaten Bagush - Matan Bagush - Martin Bagwash. In time we will eventually go through the site to make it a totally searchable database by making names and dates conform to a specific format or spelling. This includes the abbreviations for ranks. Example: S/Ldr - Sqd/Ldr - Squadron Leader. The google search engine below may be more helpfull than the standard version because it gives search results closer matched to the topic of war and the military. Mostly it is usefull for doing a quick search of the whole WEB without leaving the 113 Squadron site, but do not rely on it for searching this site as it does not look at every page. This Google search is usefull for quickly searching this entire site. Keep in mind it does not index every page so just because Google can not find it doesn't mean its not here. A "page search" as described above is the only certain way to determine if what your looking for is here or not. Rank is one of the hardest things to get right in assembling the history of the squadron. This is because final rank can not be used as it would be too confusing being out of context to the time of the event. ie: you would have F/Lt's and W/Cdr's sitting around the sargeants mess. As a result you will note that the rank of any individual varies throughout the site depending on their rank at that moment in time. In very many cases the rank indicated may be too high or too low. Final rank of course remains the same if they left the squadron tour expired but more often they went to another job and received promotions beyond what might be indicated here. Note that all of the photos and documents on the site are not the low quality resolution found on many sites for fear of someone stealing them, quite the contrary, they are the highest resolution we can get away with so you can enlarge them to look at or perhaps study any items of interest in the background. Unfortunately this can make some pages on the site exasperatingly slow to load so be patient, we are sure you will agree it's a worthwhile trade off. To understand the layout and content of this site, the site map below may be of assistance. Although these links can be used to navigate the site it is recommended to use them for reference only otherwise the flow of the site is lost and you will miss new pages that have been added. To Navigate the site properly please use the links on your left and along the top of each page. 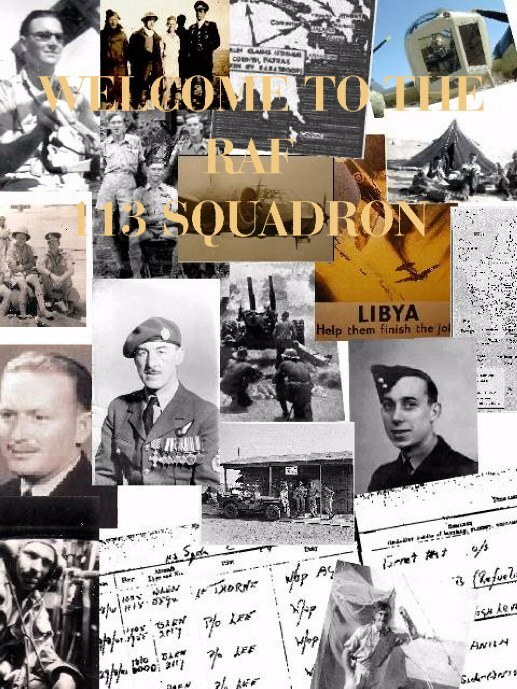 THE RAF 113 SQUADRON WEB SITE IS OWNED BY, AND COLLECTIVE COPYRIGHT OF THE 113 SQUADRON VETERANS AND / OR THEIR FAMILIES. All CONTENT FOUND HEREIN IS OWNED EITHER COLLECTIVELY OR INDIVIDUALLY AS INDICATED. There is very little on the site which is in the public domain, this means that somebody owns it and it is protected by International Copyright laws. Neither does inclusion here on the internet "put it in the public domain" any more than buying a book gives an individual the right to copy and plagiarize it. That being said, should you like to use something found here for a non - commercial purpose, you are more than welcome to ask and it is almost a certainty that permission will be immediately given. "Providing only that you agree to credit the owner and not to re-lend the material". (Keep in mind, in a very few cases we can not lend some of the material as we ourselves are the borrower and have agreed not to lend it). Where ever possible the source of a document or picture is identified and as a rule of thumb, if it is not, than that usually indicates that it is owned by the veterans and families of the squadron collectively. NOTE: We ourselves have endeavoured to secure permission for all non owned materials and pictures found within the site. Due to the substantial number of submissions not all sources could be tracked or verified. If you believe you are the rightfull owner of anything found within this site, please contact us and aside from our profound appologies we will immediately remove the material or properly credit you as the source, as you choose.